Many of the questions contained in the survey are detailed and we suggest that you have all of your organization's data available while you are completing the survey. Data should include membership and financial information (year end financial statements), population and business demographics, and information on events and activities. 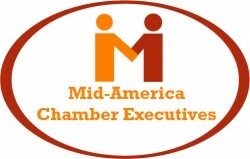 Please direct any questions you may have to Larry Dowell at info@midamericachamberexecutives.com or (651) 300-6599. We expect this survey to take about 45 minutes of your time to complete. However, it is possible to save your progress in the survey and come back to it at a later time.